We hope you all have a safe and exciting long weekend! 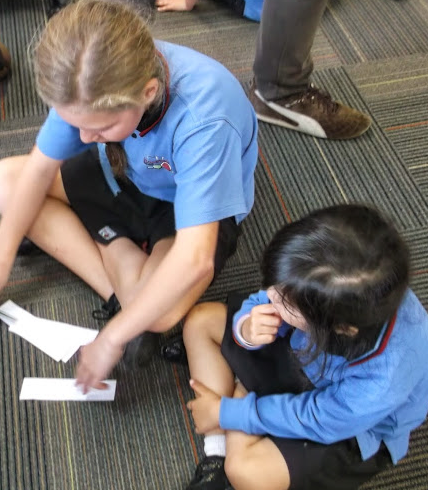 Today we learnt that there are all sorts of different ways to communicate! Do you know about these ways? 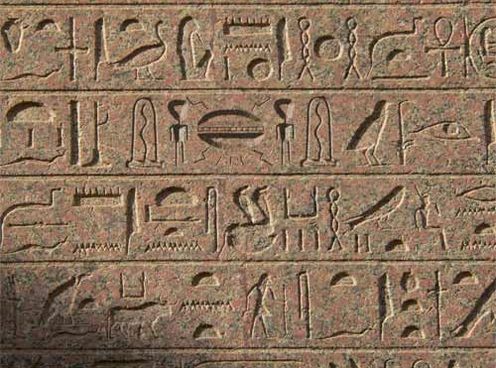 You can even click here to make your own Hieroglyphs! How else can people communicate their messages and stories? This morning we had a special visitor in the hub. Mary-Anne lives all the way in England. We learned that this is a 24 hour flight away, that means we would need to fly all day and all night to get to where she lives! Because Mary-Anne is such a long way away, we couldn't fly over here to talk to us. Mrs Elliot organised for Mary-Anne to Skype us. We talked to her on the computer, through Skype. She told us about living in England and about the different things she likes to do. We got to ask her a lot of questions about life in England and we were very interested to learn what it is like. Thank you Mrs Elliot for organising our Skype! 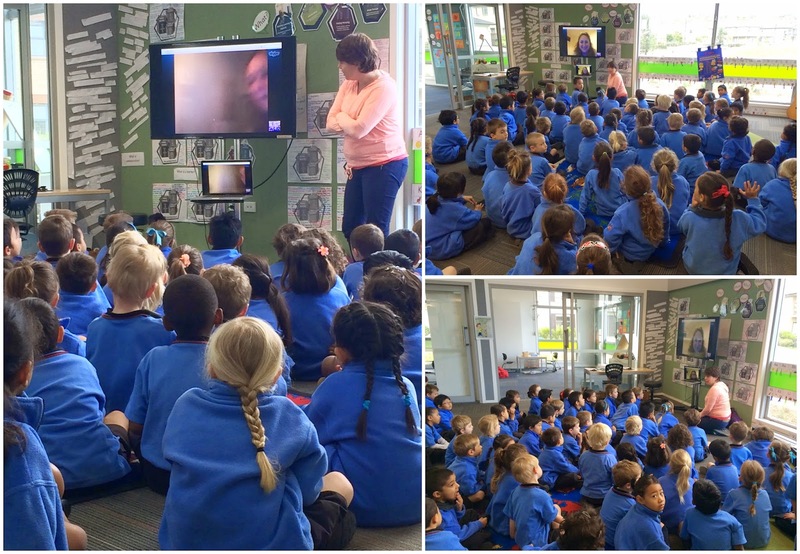 We enjoyed communicating with Mary-Anne! Do you know people living in other parts of the country or in different countries? If you do, what do you talk to them about? What questions do you ask them? 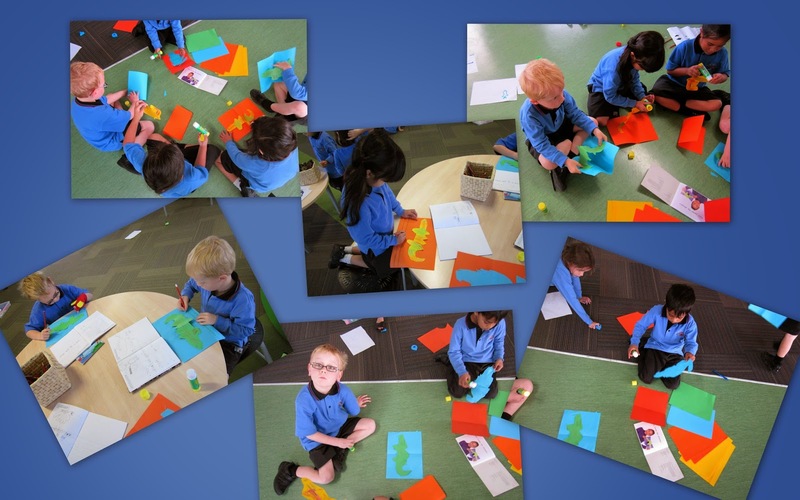 Our learners read a book called 'Making a dinosaur'. We decided to make a dinosaur card. First, we cut out our dinosaur and coloured it in. Next, glued it onto our card. After that, we described our dinosaur and wrote our words underneath. We were so busy! Can you remember the equipment we used? Can you remember the ingredients changed states from a liquid into a solid. What flavour would you create next time? Here is a video of some of the photos from our sleepover. Can you see someone you know? 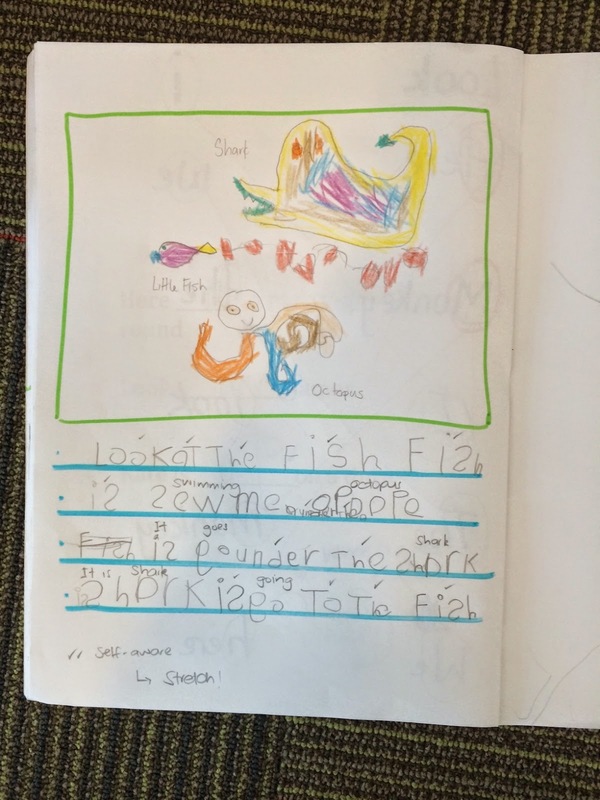 "I wrote about the crab and Little Fish. 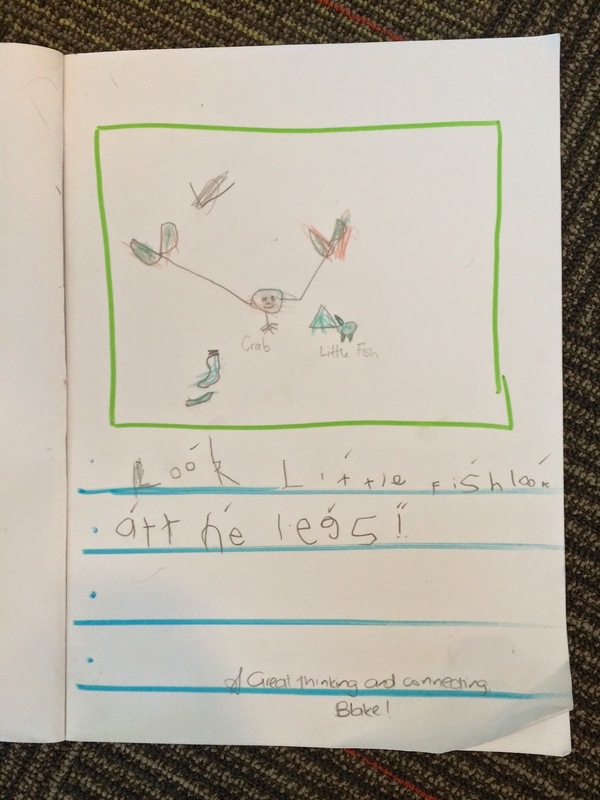 The crab has legs and Little Fish saw them" - Blake. Blake made a great connection between the crab and his legs. Dominic has been practicing his letter formation and learning how to hold his pencil well. Isn't he doing a great job! We also celebrated with our learners who have been learning to correctly say certain sounds. They've been so determined!! We are continuing to build our knowledge about ripper rugby thanks to coach Hamish. How have we communicated information about the "Three Little Pigs"? 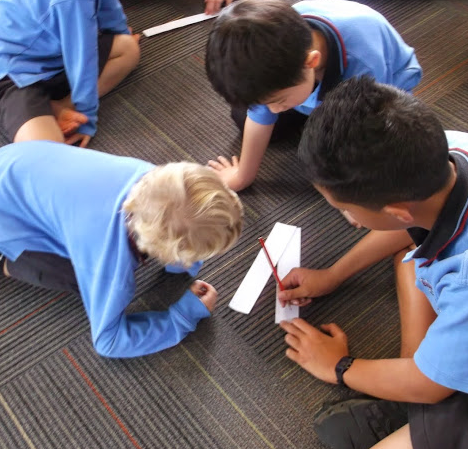 We are looking at and building our knowledge about different ways of communicating. Can you name the ways we communicating with in these pictures? Give us some reflective describing words about the sleepover!... at AnswerGarden.ch. Type in your answer where is says 'Type your answer here...' and click submit. You can do it! We made some play dough together so that we could use it to practice our list words during literacy time. It's just another great way to help us learn our words. They enjoyed taking turns and measuring out the ingredients. We had a hard choice what colours to make but in the end they decided amongst themselves. We've been learning about COMMUNICATION here in LH5 and 6. Today we talked about what that means, watched a short cartoon, practiced different communication (without talking!) and used some iPad apps to practice recognising emotions. We also danced to the Happy Song - does it make you feel happy too? Today Alexi, Hannah and Brookie tried using DoodleCast for the first time to tell a story. What feedback could you give them? One of the red reading groups has been learning about exclamation marks and bold print. Can you hear how their voices change? WE have been building our knowledge about number! Tessa what numbers are you drawing? Are you being determined? Miss P's group are looking at ordering numbers, you are having to do a lot of thinking! Well done you are building your knowledge about how many 10s are in a number. Keep going Boston, you can do it! After we had read the book We Dress Up, we decided to dress up too!! We were building our knowledge. I am a policeman, Yes constable Manav! I am a builder. Hello builder Harry. I am a dragon. I hope you are a friendly dragon Scarlett! I am a bumble bee. Happy flying Miko! I am a dragon. Do yo breath fire dragon Oscar? I am a spaceman. What planets have you visited Lucas? We had so much fun with coach Hamish!! We were being very determined learners. Do you remember what you said about communication? After reading 'Tom's Ride' we thought about how we could be inclusive of the new Sommerville children to Stonefields School. Have a look at our fabulous ideas! I wonder which idea you will choose? How will you action it? What do you know about communication ? writing down what we know. We have chosen our break through groups today. Can you think how you might use the story to help you develop your knowledge of the break through context?